Videos, worksheets, examples, and solutions to help Grade 7 students learn how to graph lines using the slope-intercept method. 1. Plotting points by making a table of ordered pairs always works, but can be time-consuming. 2. Finding the x-intercept and y-intercept doesn't work if it goes through the origin. 3. Slope-intercept method works unless it is a vertical line (x = k). How to graph lines using the Slope-Intercept Method? 1. Solve the equation for y to put in the form y = mx + b. 2. Identify slope and the y-intercept. 4. Use slope to find more points. 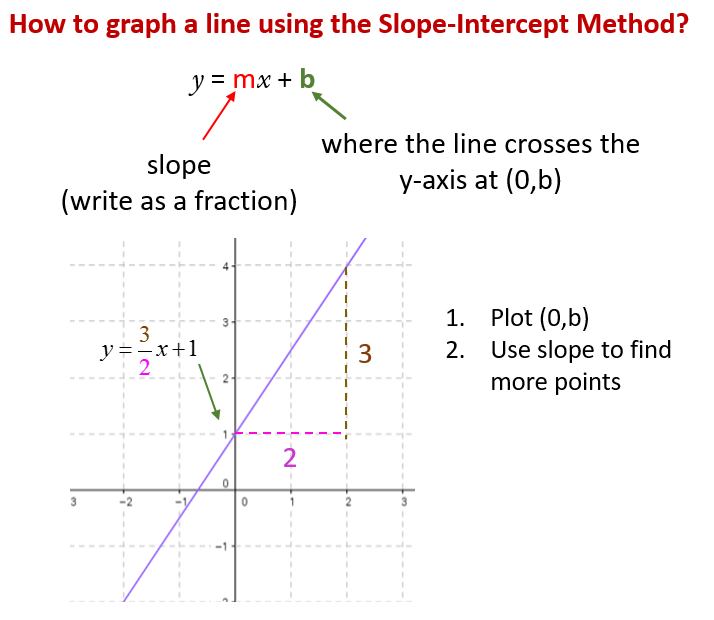 The following diagrams show how to graph a line using the slope-intercept method. Scroll down the page for more examples and solutions. 2. Use slope to find more points. Since there is no y-term, we can't put the equation in slope-intercept form and we can't use the slope-intercept method. Any line in the form x = k is a vertical line with x-intercept k.
This is a summary of the 3 methods for graphing lines: plotting points, x-intercept and y-intercept, slope intercept method.